← April Bike P-AAAAARRR-ty: Pirates! April PIRATES Bike P-AAAAAAR-ty Details! 3) START: Meet as usual at 6:30 at St Mary’s Park in Seton Hill and roll out at 7pm SHARP. Every month Seton Hill Community Association provides bathrooms for us in the building in the park! 5) PARKING: We encourage everyone to BIKE to the event, but if you are coming from out of town, consider parking near the after party and biking up to the start while it’s still light out! Please DO NOT PARK IN THE LOT at Little Havana; that is where the party is! Please park in the metered parking along Key Highway if parking near the after party. 6) AFTER PARTY: We will be ending this month at the lot NEXT to Little Havana! This is our first outdoor event for the season, so if you haven’t been before, expect food trucks, beer, wine, music, and the photobooth! 7) For those new to Bike Party, you must purchase TICKETS at the ticket table in order to get drinks! 1 ticket = 1 drink. Tickets are $4 each or 3 for $10. Little Havana, our gracious hosts this month, are asking that NO OUTSIDE ALCOHOL be brought in this month, so heads up! 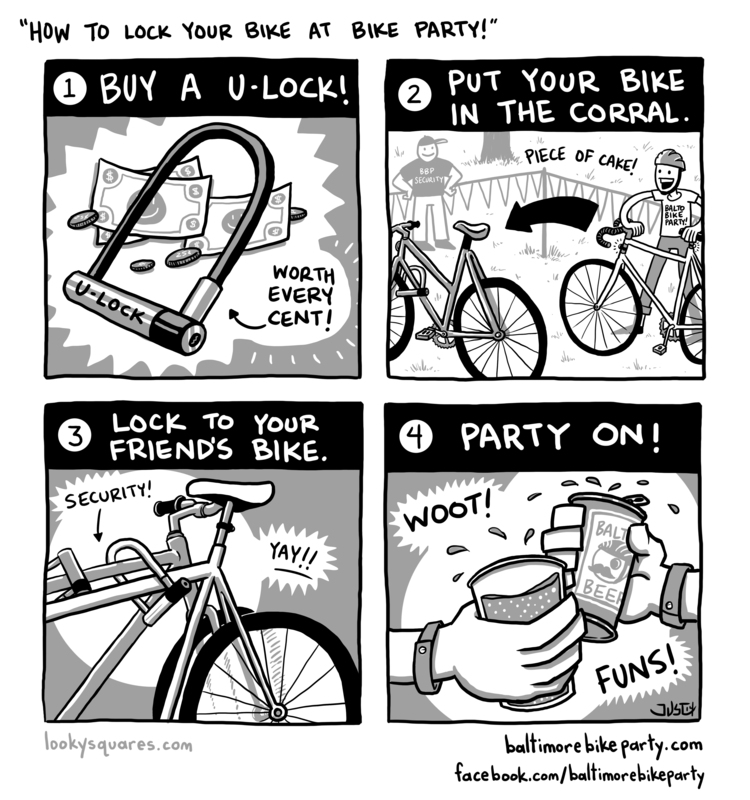 8) When you arrive at the after party, please PUT YOUR BIKE INSIDE THE CORRAL. Bikes locked up out on Key Highway are MUCH more vulnerable to theft! Read more about how to lock up here. 9) AFTER-AFTER PARTY: We have to close down the event outside at 11pm, but if you want to keep partying, head around the corner and into Little Havana for more fun! Just remember, if you are locked in the corral, TAKE YOUR BIKES WITH YOU and lock them up out front of Little Havana, as our security will be gone before you are!